The Cairn is the smallest of the Terrier group of dogs breed. They were originally bred in the Scottish Highlands for their strong work capability. The Cairn Terrier is built sturdy and strong, but not built heavily, its a very small dog breed. The Cairn Terrier is one of the oldest terrier breeds,recognized as one of Scotland's earliest working dogs. It is used for hunting and burrowing prey among the cairns. 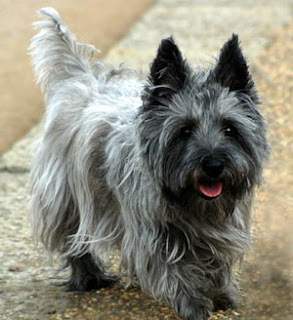 This breed of dogs is known to be intelligent and smart, The cairn breed is also known to be a brave breed. It is a great watchdog because it is very active and barks at every new sight and sound. This breed is known to be active and a very lively breed of dogs.Because of its active nature the cairn breed of dogs is always on the go and seeking some sort of activity. It is a very friendly breed and is known for its playfulness and loyalty, this breed is ideal for children over the age of six. The Cairn Terrier has a double coat of hair on its body, the outer coat is coarse while the inner coat is soft, coarse and furry, This breeds coat does not require trimming and is resistant to weather. It is considered a good breed because it sheds very little to no hair at all. The dogs belonging to this breed should be brushed several times a week and the hair around the eyes and ear will need to be kept trimmed. If you own this breed of dogs you should be especially careful not to overfeed as the cairn is known to gain weight rapidly which is not good for its health. This breed is not suited to live outdoors and much prefers ti live inside with the family. The Cairn Terrier is eager and fast at learning. The breed is sensitive, so they require firm, training and discipline. They like to learn tricks, and thrive in obedience training. Without training and attention, the Cairn Terrier will become bored and destructive. Training should be started at an early age so the dog absorbs and learns and is a disciplined pet. The Cairn Terrier is usually a very healthy dog breed. The average lifespan for this dogs breed is 15 years.But like all other breeds it is susceptible to some hereditary diseases and health problems. Other dog diseases and health problems caused by nonspecific factors (i.e. infections, toxins, injuries, or advanced age) are also likely to happen. It is important that dog owners keep a check on the health of their dogs so dog diseases can be diagnosed at an earlier stage and proper treatment can be given to keep you pet healthy and comfortable.